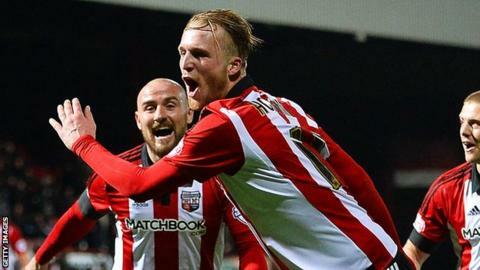 Striker Philipp Hofmann's injury-time goal secured a dramatic win for 10-man Brentford against Nottingham Forest. Hofmann's low shot after Ryan Woods' initial effort was saved won it for the Bees, who had Harlee Dean sent off earlier in the second half. Sergi Canos put the hosts in front on 63 minutes, tucking in after Dean's header dropped into his path. Henri Lansbury equalised, but despite dominating chances, Forest conceded in the sixth minute of stoppage time. Victory for Brentford, under interim boss Lee Carsley, ended a run of two games without a win on the back of four straight victories. But defeat for 18th-placed Forest adds to the pressure on Dougie Freedman, despite his side coming into the game after a win against East Midlands rivals Derby. It was a success that ended a run of eight games without a win and they used that momentum in a fine first-half performance. However, Forest were unable to turn chances into goals as Nelson Oliveira was denied by Brentford goalkeeper David Button three times. After a goalless first half, Brentford were more adventurous after the break and after John Swift's effort was saved by Dorus de Vries, Canos pounced in the box to open the scoring. Dean's dismissal, after a scuffle over the ball with Jonathan Williams at a set-piece, was followed by Lansbury's equaliser. However, despite a numerical disadvantage, the home side showed the more intent late on, with James Tarkowski striking the post with a header before Hofmann's calm finish in added time snatched the three points. "This was my last game so it was nice to get a result." "My remit was always to get us back on track and now, with the way we've been playing and a lot of the injured boys coming back to fitness, I can say I've done that. "It took us about an hour to get going but I thought we got better and better as the game wore on. The substitutes gave us more energy and both scored, so that was nice to see. "Harlee will be a big loss for us. He was one of the boys not doing themselves justice at the start of the season, but he is now playing like a leader." "In the first half we were in complete control and should have been two or three up. "We had four or five chances but didn't take them and I'm fed up of saying that after games. "After the sending-off they were more compact and showed more fighting spirit, while we just got more and more naive. "The result was definitely of our own making." Goal! Brentford 2, Nottingham Forest 1. Philipp Hofmann (Brentford) left footed shot from the centre of the box to the bottom left corner. Attempt saved. Ryan Woods (Brentford) right footed shot from the right side of the box is saved in the bottom right corner. Assisted by Toumani Diagouraga. Ryan Woods (Brentford) is shown the yellow card for a bad foul. Daniel Pinillos (Nottingham Forest) wins a free kick in the attacking half. James Tarkowski (Brentford) hits the left post with a header from the centre of the box. Assisted by Alan McCormack following a set piece situation. Ryan Woods (Brentford) wins a free kick in the attacking half. Foul by Jonathan Williams (Nottingham Forest). Attempt saved. Henri Lansbury (Nottingham Forest) right footed shot from outside the box is saved in the top centre of the goal. Attempt saved. Sergi Canos (Brentford) right footed shot from the right side of the box is saved in the bottom left corner. Assisted by Nico Yennaris. Corner, Nottingham Forest. Conceded by Ryan Woods. Offside, Brentford. Alan McCormack tries a through ball, but Sergi Canos is caught offside. Offside, Nottingham Forest. Jonathan Williams tries a through ball, but Dexter Blackstock is caught offside. Attempt missed. Dexter Blackstock (Nottingham Forest) right footed shot from very close range misses to the left. Assisted by Jamie Ward. Philipp Hofmann (Brentford) wins a free kick on the left wing. Goal! Brentford 1, Nottingham Forest 1. Henri Lansbury (Nottingham Forest) right footed shot from outside the box to the bottom right corner following a set piece situation. Substitution, Brentford. Jack O'Connell replaces Alan Judge. Harlee Dean (Brentford) is shown the red card for violent conduct. Toumani Diagouraga (Brentford) wins a free kick on the right wing.